Among the most important marketing goals of a company are – creating brand awareness, generating demand, and establishing long-term profitable relationships. It doesn’t matter what your marketing campaigns are, it all starts with analyzing market segments and then find out who your most valuable customers are. Typically, marketing campaigns include a lot of important activities like establishing various marketing campaigns and running them across different channels, finding out who the potential customers and are targeting them, generating leads for supporting sales force, giving collateral, and finally, analyzing all these efforts to ensure the success of your marketing efforts. SAP CRM – Marketing will simplify, provide direction and monitor all these activities for you from anywhere, anytime. Why is SAP CRM required? It is needed as it helps automate all your core marketing activities using on-premise and integrated CRM marketing capabilities. It slowly but surely helps build your customer base. In using CRM Marketing, it is also possible to create segmented lists, deploy marketing campaigns that are really cost-effective, and personalize offers. 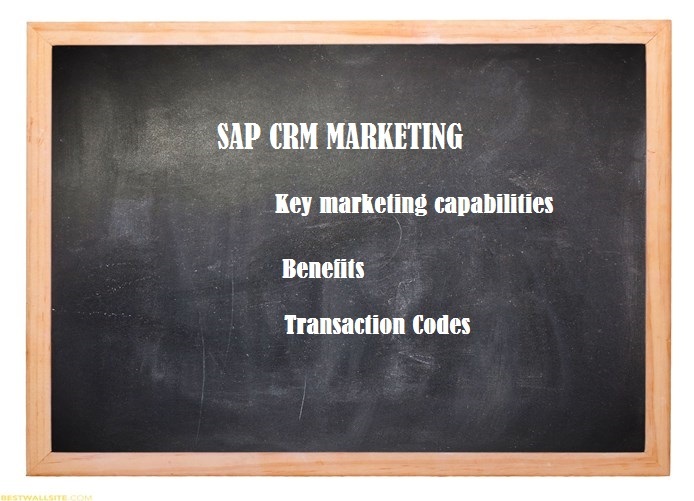 How SAP CRM-Marketing can benefit your company? Marketing Resource Management – Helps align all your marketing resources, manage marketing spending, and establishes accountability into different marketing activities – using easy-to-use and efficient resource management tools. Segmentation and List Management – Helps find and target different customer segments across large amounts of data – using a drag-and-drop interface that is intuitive and provides valuable inputs. Campaign Management – Helps manage campaigns by planning, coordinating, and executing various steps whilst encouraging interactions with valuable customers and revenue maximization. Lead Management – In using this tool, it is possible for create, prioritize, send high quality leads automatically to various third-party partners and sales agents. All this is done to improve the conversion rates. Loyalty Management – These tools are pretty useful in elevating customer allegiance by planning, developing, and managing different loyalty programs. Sales Contract Management – These SAP CRM Marketing tools are required to empower your sales teams to work closely and efficiently with customers in developing and revising various contracts at different points in a contract lifecycle. Marketing Analytics – Helps you make the best use of various powerful marketing analytics, including dashboards, operational reporting, predictive modeling, and advanced analytics. If marketing policies of an organization have to be implemented to perfection then a proper marketing plan is required. Therefore, in any marketing project hierarchy, these plans are considered as one of the important elements that can be used as tools for planning out budgets and finalizing targets. In SAP CRM, each marketing element has a well-established life cycle that will start with the market element creation and will end with their cancellation or closure.